Visiting the Palace of the Legion of Honor Museum is always visiting a very special place. Almost a world of its own, the museum sits at a distant end of The City on a hill overlooking the Pacific Ocean, the San Francisco Bay, and the Golden Gate Bridge.The site is so breathtaking that one’s attention could be turned away from the beautiful building. It was built to echo the Legion of Honor in Paris and to honor the Californian “boys” who had died in World War I. As it is just two days away from Veterans’ Day, it is worth remembering to remember. Now, until January 18, 2015, the Legion hosts an exhibition which re-creates another special place within the museum. 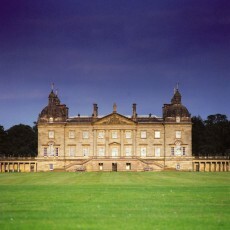 In 1728, Houghton Hall was called “the completest, beautifulest” of all country houses. It is gigantic, full of treasures and history. It was the home of Robert Walpole, England’s first Prime MInister and a voracious collector. When he died, in 1755, he left an enormous debt. His family sold Robert Walpole’s collection of Old Master paintings to Catherine of Russia, helping to make her Great and their debts less. In an odd quirk of history, the family has been able to hold on to the property because no one would buy the immense house and its 17,000 acres. Lucky for us. The property passed to Horace Walpole and then to a grandson of Sir Robert’s daughter. A fortuitous marriage to the Chomondeley family of Cheshire further secured both families’ properties. David Cholmondeley, the 7th Marquess of Cholmondeley (pronounced “Chumly”) and Lord Great Chamberlain of England is now in charge of both. His grandfather married the exquisite Sybil Sassoon, a descendant of the Rothschild family who brought her personal elegance, devotion to Houghton Hall, and more financial stability. Speaking to a group of journalists, David Chomondeley reminisced of happy times with his grandmother. 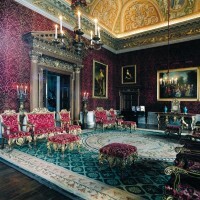 She introduced him to treasures and special places in Houghton Hall, including the grand staircase which she restored. Among many fine things in the exhibition are paintings by Gainsborough, Reynolds, Andrea del Sarto, Artemesia Gentileschi, and Hogarth. Visitors will be inside the library from which Robert Walpole ran England. This was the first house in England to use mahogany instead of oak. While building it, Robert Walpole took import duties off of mahogany; he put them back when the Hall was finished. There are also Sevres china rarities collected by George Chomondeley, the current Marquess’s grandfather, grand silver, statues. 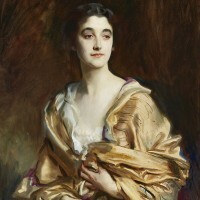 One gallery has portraits of Sybil by John Singer Sargent. The beautiful lady is now overseeing the visits of so many new guests to her San Francisco home. When you visit, you will also have the opportunity to enjoy an English tea being served in the Museum’s lovely cafe. Pictures, courtesy FAMSF: Houghton Hall exterior; Sybil Sassoon, Marchioness of Chomondeley, by Sargent; interior of Houghton Hall; Hogarth painting of Chomondeley collection. 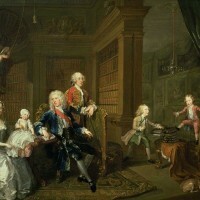 This entry was posted in Hedgehog Highlights and tagged Cheshire, David Chomondeley, English Country House, English tea, Fine Arts Museums of San Francisco, Hogarth, Horace Walpole, Houghton Hall, John Singer Sargent, Marquess of Chomondeley, Norfolk, Palace of the Legion of Honor Museum, Robert Walpole, Sybil Sassoon, William Kent on November 9, 2014 by Leslie. The opera Partenope: 6 characters, 3 hours and 20 minutes, Baroque opera by Handel. Turns out it is a laugh riot. What 21st century music lover who is not totally up on Baroque could guess that? San Francisco Opera’s production of Partenope, performed Oct.15-Nov. 2, 2014, was originally created by the English National Opera and Opera Australia. It traveled well. An attempt at a summary of the plot: Partenope loves Arsace, the cad who abandoned Rosmira. Rosmira, convincingly dressed as a man, shows up at the house party. She/he claims to be in love with P., too. Shy Armindo is madly in love with P., but she can barely see him. Emilio arrives and offers to marry P. She refuses. E. threatens war. P. asks A(Arsace). to lead her forces. The other men and “man” have their feelings hurt. Ormonte observes. That’s just the first 20 minutes or so. The voices of all the performers were outstanding. Two of the men sang countertenor roles; David Daniels as Arsace and Anthony Roth Costanzo as Armindo. Those voices are higher than the voices of the two females; it’s just one layer of Handel’s satire of operatic conventions of his time. Daniels and Roth Costanzo were wonderful performers. Arsace’s emotions ranged from ardent suitor to dejected reject. Armindo, amazed by Partenope’s sudden declaration of love, breaks into a tap dance with top hat and cane on top of his nightie. Daniela Mack as Rosmira/Eurimene is conniving, passionate, heartbroken while in excellent voice. Danielle de Niese as Partenope, the Queen Bee to whom all the energy of the others is devoted, is more than an opera singer. She moves with the grace and assurance of a dancer thoroughly at home moving on stage. Her statuesque form plus her engaging presence showed that Handel was correct to make an opera all about her. It is a funny opera.Would we have missed the satire without the toilet paper? Director Christopher Alden packed the 200 minutes with sight gags including potty jokes. Emilio is interrupted by a sound; is it water? oh, no, it is a toilet flushing. Partenope walks out a door revealing a toilet. Emilio, sung by Alek Shrader with authority and a self-satirizing awareness, sings while hanging from the bathroom’s transom, makes hand shadows as though at camp, and executes a hilarious yoga routine. The set designed by Andrew Lieberman adds another star to the cast. The winding staircase in Act I is not only gorgeous but also gives Armindo an opportunity to show that he can fall down all the stairs–face down–and hang from the edge while still singing. A great addition to SFO’s repertory, it suggests one get out there to see more of Handel’s operas, maybe even this one in another production to see if Handel’s own humor is still there. Pictures: (L to Rt, top row)Danielle de Niese, David Daniels, Alek Shrader, Anthony Roth Costanzo, Daniela Mack(bottom row) Philippe Sly, staircase, Danielle de Niese. This entry was posted in Hedgehog Highlights and tagged Alek Shrader, Andrew Lieberman, Anthony roth Costanzo, Baroque Opera, Christopher Alden, Daniela mack, Danielle de Niese, David Daniels, George Frideric Handel, Handel, Partenope, Philippe Sly, San Francisco Opera on November 5, 2014 by Leslie. This entry was posted in Lively Foundation News & Events and tagged Austin, Bat Conservation International, BAT TALES!, Bats, Bracken Cave, Jon Deak, Jonathan Harvey, Leslie Friedman, Lucy & the Count, Mine Bat, Nature Conservancy, San Antonio, Texas, The Lively Foundation, William Stolzenburg on November 1, 2014 by Leslie.